Sometimes, mathematics appears in places that we sometimes least expect it to be — like in dancing. Although the figure above is bit of a stretch, Erik Stern (educator, choreographer) and Karl Shaffer (choreographer and mathematician) from John F. Kennedy Center for the Performing Arts in Washington literally integrated mathematics and dancing in what they called Math Dance. 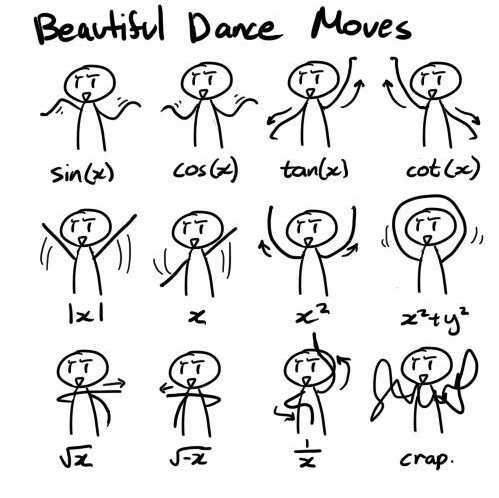 In Math Dance, a class looks like a dance lesson, but it is also a new way of teaching mathematics. Math Dance involves translating patterns into choreography and translating patterns to mathematics. Some of the mathematics learned in math dance are polyhedral geometry, symmetry, the mathematics of rhythm, and variations on dissection puzzles such as tangrams. The full article with video about Math Dance can be read here. Image Source: Unknown (please inform me about its origin if you know).